Speciality: Repair, upgrade and restoration Web: www.theguitarrepairworkshop.com Phone: 0161 877 4962 Email: theguitarrepairworkshop@gmail.com Address: c/o PMT Manchester, Red Rose Retail Park, Regent Rd, Salford M5 3GR Opening Hours: Monday-Saturday 9.30am to 6pm. Located within PMT Music Store in Salford theguitarrepairworkshop.com is a large in-house repair and restoration facility. Pro-set up: Electric & Acoustic instruments, All types of fretwork including level & dressing, partial and full re-frets. 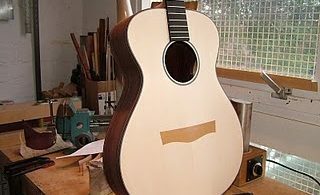 Electric and acoustic pick-up repair and upgrades. All manor of structural work including broken headstock repairs, re-glue braces & bridges, cracks and severe damage repair. We can supply and fit hundreds of different parts including machine heads, scratch plates (standard and custom made), Bridges & saddles on electric and acoustic. Full pro re-sprays, 2-pack or nitro cellulose. Pretty much everything from replacing a single string to a custom built acoustic guitar. Go to their MySpace page and view the blog to find a list of their services and prices.